Piracy at sea is nothing new. Ships have been hijacked since the dawn of time and the problem is still rife in many parts of the world today. Paul Greengrass’ Captain Phillips shows us superbly what it can feel like when a ship gets taken over by a gang with guns. 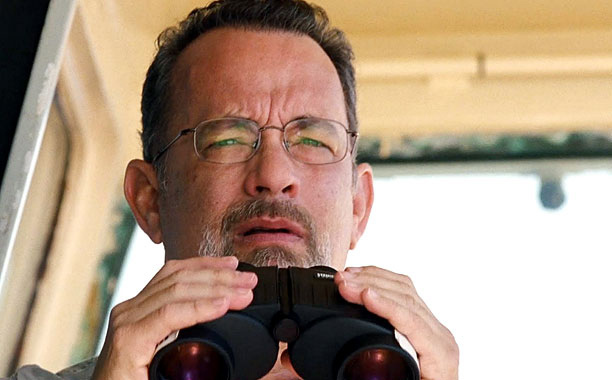 Captain Phillips (Tom Hanks) on the look out for pirates… and worried by how quickly they’re advancing toward his ship. Captain Phillips is based on the true story which occurred in 2009 and the book, which came out the following year called A Captain’s Duty: Somali Pirates, NAVY seals, and Dangerous Days at Sea by Captain Richard Phillips, himself. The film is about when the Maersk Alabama, a large cargo ship, is seized by Somali pirates near the Horn of Africa, and the crew are taken hostage. 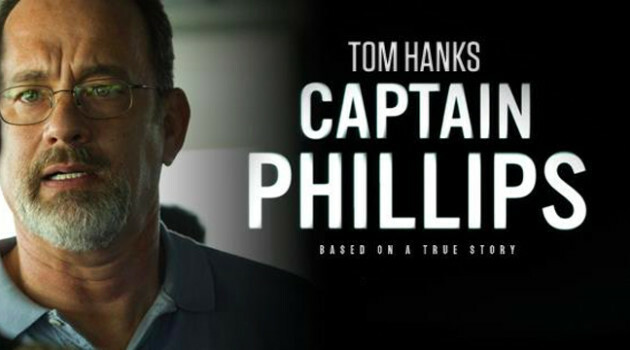 The plot for Captain Phillips is straightforward, grounded and gets to the crux within 20 of its 134 minute running time. From them on the film is tense; so tense, one’s heart pounds in sync with the background beats, and one’s arms shake almost as much. Also, as the film is long, one feels as if the situation is being drawn out in real time. This is despite no lawyers appearing in the film, and little attention given to events behind the scenes in instances of hostages at sea (unlike the very good Danish film, A Hijacking). The pirates on their little speed boat, eager to seize Maersk Alabama and gain a reward for it back in Somalia. That Somali piracy is a current and serious issue enhances the horror of the situation for Captain Rich Phillips and his crew, and the close up shots (Greengrass’ trademark) enable viewers to see the fear of captain and crew at hand. Although, there is a law suit presently being waged against Captain Phillips, claiming that the movie does not portray events aboard the Maersk Alabama in the run up and during the hijacking truthfully, the film feels (for the most part) chillingly realistic. Some may argue that the realism becomes less convincing as the movie goes on; for example, neither captain nor crew complain of hunger throughout the ordeal. But in the main, Captain Phillips seems sincere, irrespective of the outcome of the lawsuit. Captain Phillips’ genuineness is helped by the pirates looking bloody scary and behaving in a frenzied fashion. Tom Hanks is likely to gain much of the plaudits come Oscar season, and his display is absolutely brilliant as the heroic (though this point is legally being disputed) and beleaguered captain; indeed, the grimmer the situation becomes, the better Hanks performs. However, the actors playing the pirates do just as much, if not more, to make the film as thrilling (stressful) as it is, since viewers are never sure how the pirates are going to react to movement on the ship, or outside of it. The pirates, having taken the ship and Captain Phillips hostage, telling the captain that they’re in charge. What is quite remarkable is that the film makes us empathise with the pirates’ predicament. 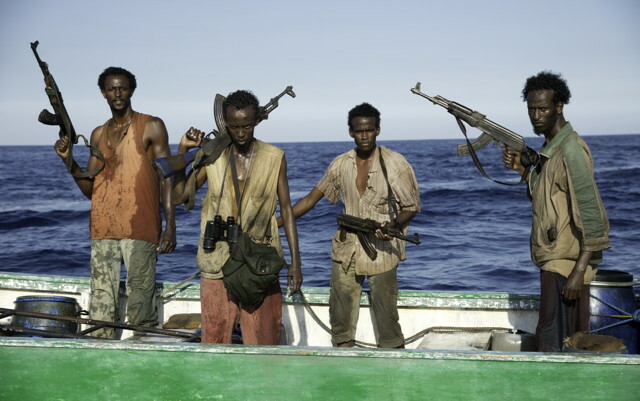 Barkhad Abdi, Barkhad Abdirahman, Faysal Ahmed and Mahat M Ali, the four men playing the pirates (lacking all the glamour and savvy of Johnny Depp’s Captain Jack Sparrow or Geoffrey Rush’s Captain Barbossa from Pirates of the Caribbean I-IV), show us why some Somalis turn to piracy, as well as the problems that await them should they return home without large sums of money, or at least with a great bargaining chip to acquire large amounts of money. One almost comes to pity the pirates’ plight… but for the small matter of them holding a crew (and Tom Hanks) hostage. 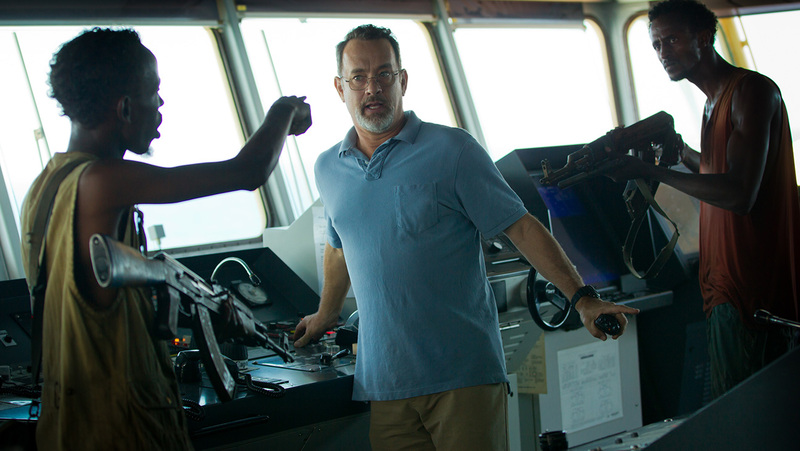 All-in-all, Captain Phillips is a nerve-shredding, finger-biting thriller. Granted, the film almost exclusively focusses upon events on the ship and little else. But the movie is grounded and, regardless of its factual accuracy, it feels honest in every respect. Furthermore, Captain Phillips makes viewers experience the terror of modern-day pirates seizing a vessel at sea. This entry was posted in Action, Based on Real Events, Book based, Thriller and tagged a hijacking, based on real events, book, book by captain phillips, captain phillips, cargo, film, horn of africa, maersk alabama, navy seals, pirates, review, ship, somali pirates, somalia, tom hanks, toy story. Bookmark the permalink.